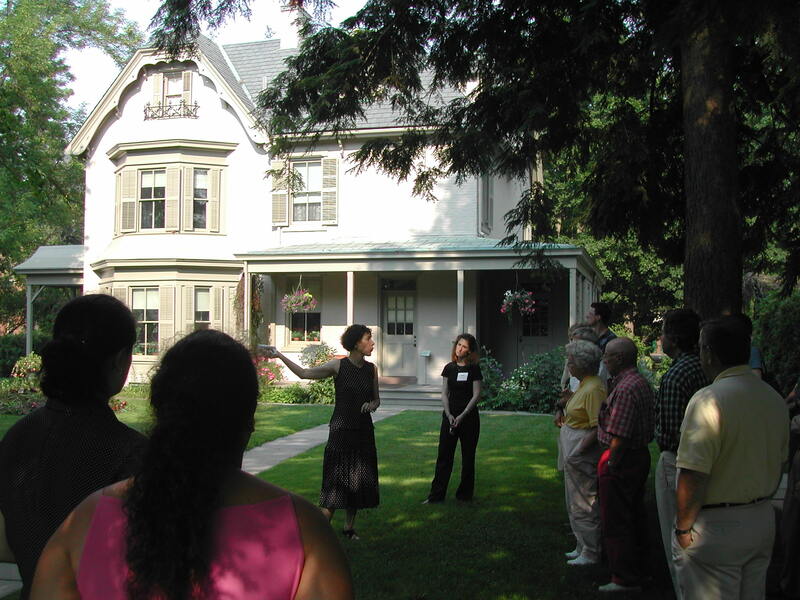 Historic house museum workshop participants taking a tour of the Harriet Beecher Stowe House in 2003. It’s gutsy, but if you’ve ever met Katherine Kane, the executive director, you’ll know the source (there’s something about the name Katherine that inspires moxie: Catherine Beecher, Katharine Hepburn, Catherine the Great of Russia. . .) and she’s pulling it off impressively. Take a look at their website and you’ll see they offer tours that focus on abolition and women’s rights; school programs that discuss homelessness and expository writing; and community salons on student achievement, infant mortality, and minority-owned businesses. Not many historic house museums get involved in these topics. The latest effort is the launch of a Student Stowe Prize to recognize outstanding writing by a high school or college student in the U. S. that motivates positive action for social justice on an issue critical to contemporary society, such as race, class and gender. Short stories, essays, student-created and managed blogs, newspaper articles, editorials, memoirs, news or investigative reporting, poetry, and screenplays are acceptable formats but entries must have been published or publicly presented and are due February 27, 2012 (in case you want to encourage someone to apply). The awards will be presented at the Stowe Center in a ceremony and public program in June. This entry was posted in Leaders in the field, Strategy and tagged Harriet Beecher Stowe Center; Katherine Kane on January 11, 2012 by Max van Balgooy.